January 26, 2017 /Photography News/ Celebrated annually on 26 January, Australia Day (previously known as Anniversary Day, Foundation Day, and ANA Day) commemorates the arrival of the First Fleet at Sydney Cove in 1788 and the proclamation at that time of British sovereignty over the eastern seaboard of New Holland. 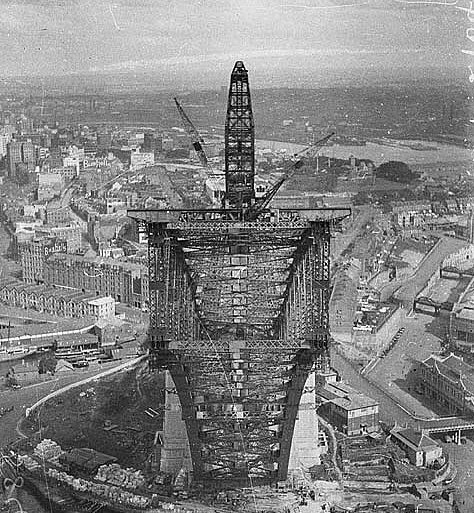 The collection below is a photographic record of the people, places and events of Sydney after 1870, highlighting the history and changing nature of Sydney, Australia's first and largest metropolis. Courtesy of the State Library of New South Wales. 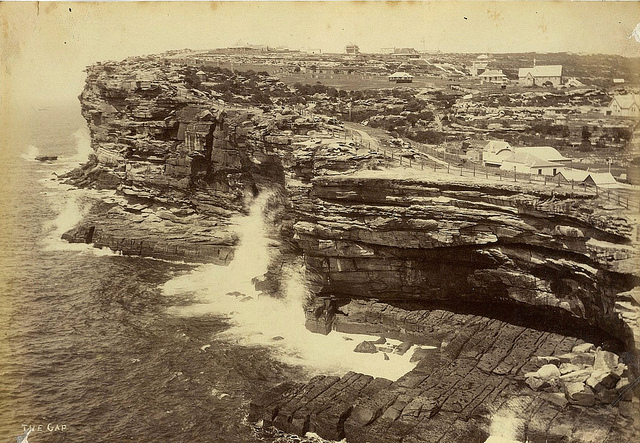 The Gap, Sydney, 188- / photographer unknown. Note: Sydney's most notorious suicide spot, the cliff in front of the buildings, right. On 20 September 1857, the Dunbar was trying to enter Sydney Heads at night in a blinding storm and was smashed on the rocks, lower right. Only one survivor was found the next day. The Dunbar was less than a mile from safety after her more than 10,000 mile journey from Britain. Children still marvel to the story as they view the anchor now on display on the clifftop walk. 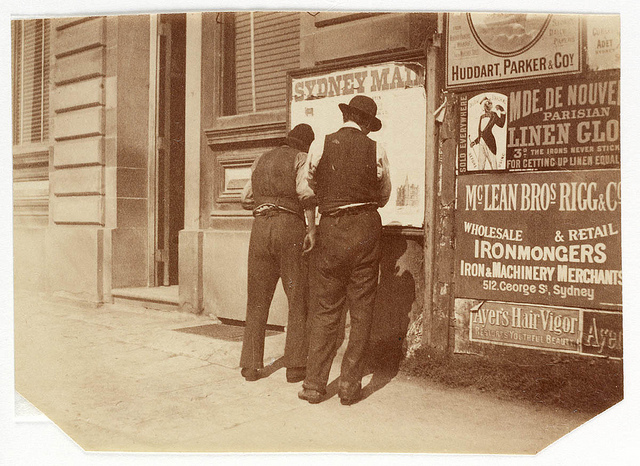 Advertising hoarding for McLean, Rigg from Sydney, ca. 1885-1890 / photographed by Arthur K. Syer. 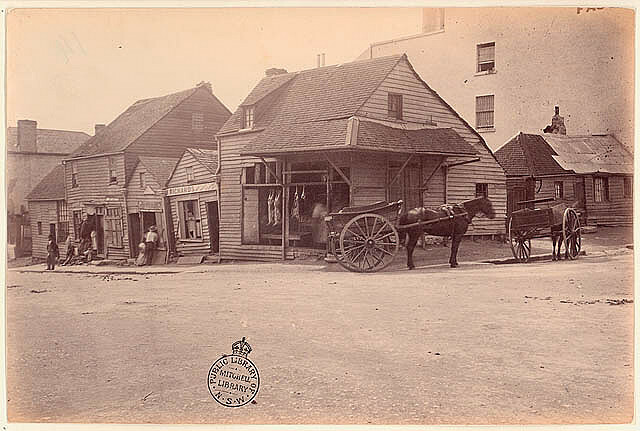 King and Elizabeth Street corner from Sydney, 1890 / photographed by Arthur K. Syer. 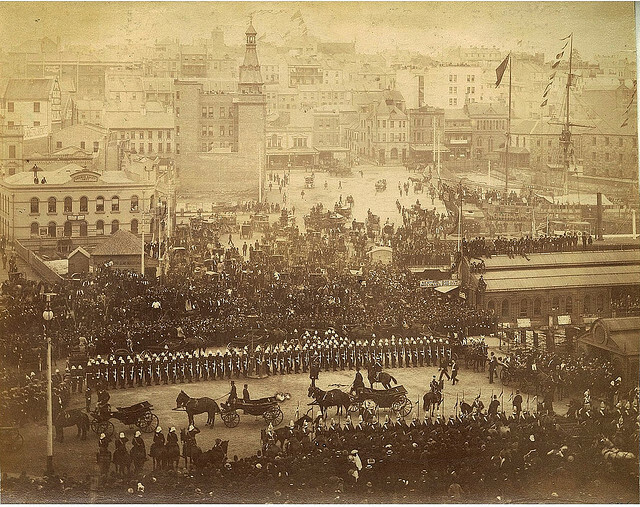 Arrival of Governor Sir Robert Duff, Circular Quay, Sydney, June 1893 / photographer unknown. Note: the sailing ship called the "Convict Hulk Success", a commercial exhibit, upper right, and the bald-faced building with two towers which is a fire station, upper left. 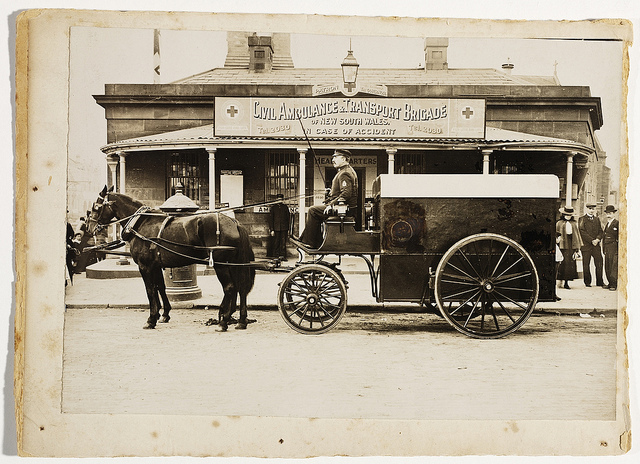 Horsedrawn ambulance outside Civil Ambulance & Transport Brigade headquarters, corner of George & Pitt Sts opposite the Benevolent Asylum, now Central Square, c. 1900, by unknown photographer. [Pedestrians on George St], ca. 1900, from Frederick Danvers Power : photonegatives, 1898-1926 / Frederick Danvers. 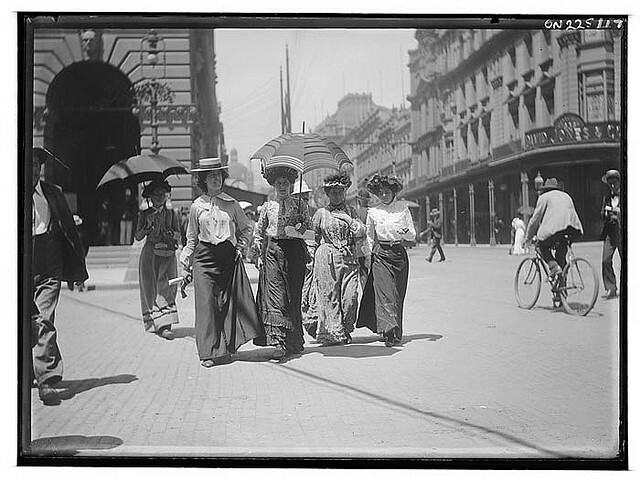 Power Notes: Amateur photographer Frederick Danvers Power had a concealed detective camera, which he used to snap these women crossing Martin Place at George Street, with the Post Office behind them. This image gives us a more accurate idea of what women actually wore, than formal studio photographs or magazine illustrations. People wore their best outfit to the portrait studio and parasols and hats, which shaded the face, were not permitted. On the other hand, the idealised renditions of fashion published in magazines show neither creased clothes nor worn shoes. 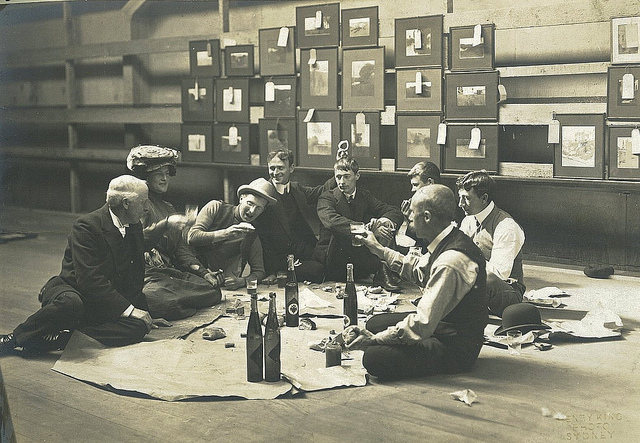 Society of Artists' Selection Committee, Sydney, 1907 / photographer Henry King. (l to r) Julian Ashton, Mrs Norman Lindsay, Harry Weston, Will Dyson, Norman Lindsay, young Souter, Sidney Long & D.H. Souter. Norman Lindsay is perhaps the best known of these young bohemian artists having a picnic in their rooms. He is looking pensive, fifth from the left. 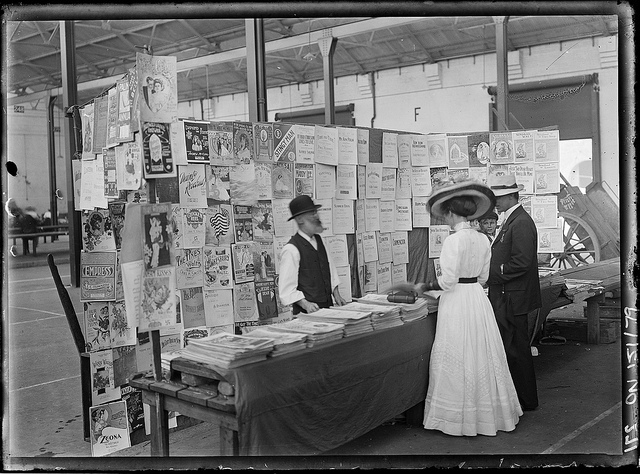 Sydney markets, by Rex Hazlewood, c. 1911-1916. New gas-masks for the NSW Fire Brigade, Castlereagh Street headquarters, Sydney, 1927 / Sam Hood. 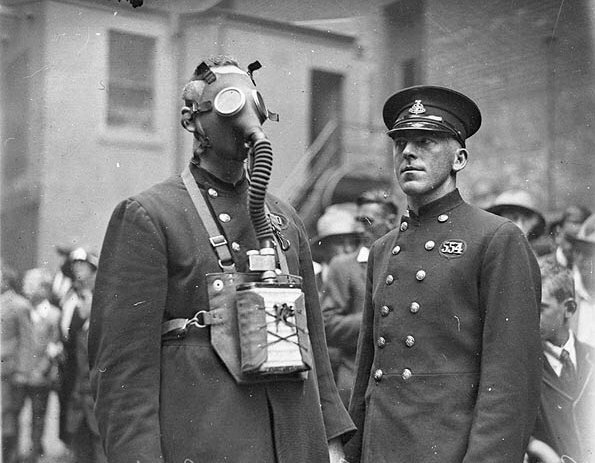 Firemen display their latest gasmask at the Fire Brigade's Castlereagh Street headquarters, where popular demonstrations for the public were given on Wednesday afternoons. Twenty four pigs being driven along Day Street, Sydney, by a truck, ca. 1929 / Sam Hood. 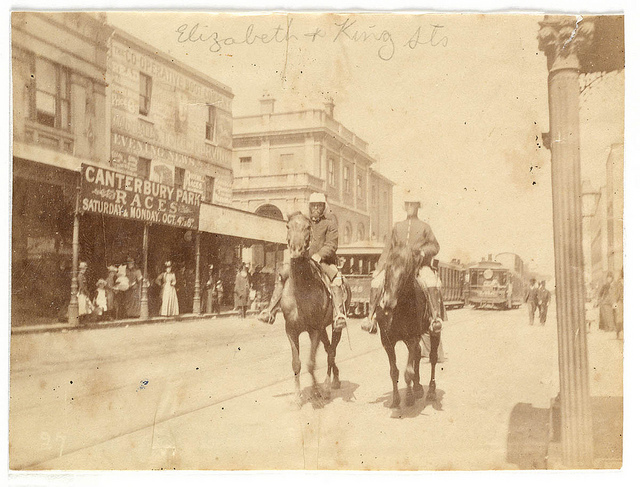 Notes: As odd as it may seem today, Sydney regularly had livestock in its streets. 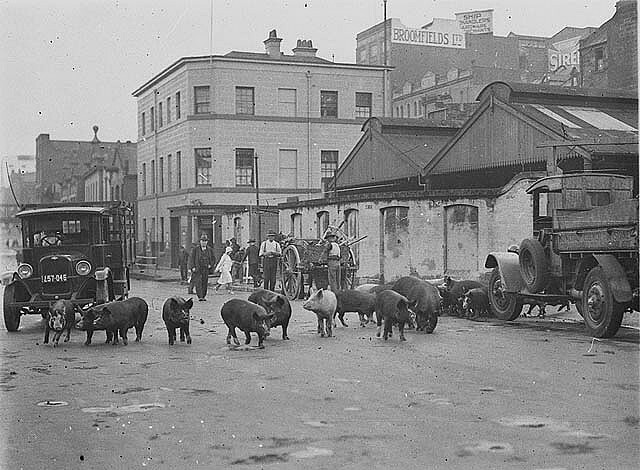 However, this example of a truck driving a herd of pigs along the Day Street waterfront towards Market Street is an anachronism, as the area for penning animals had become the City Council depot and the city livestock markets had moved 20km out of the city to Homebush. 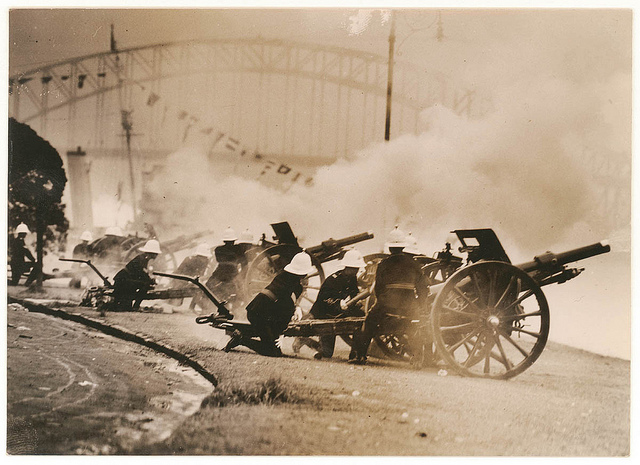 Views in Sydney and New South Wales, 1930-40 / by Charles F. Walton. 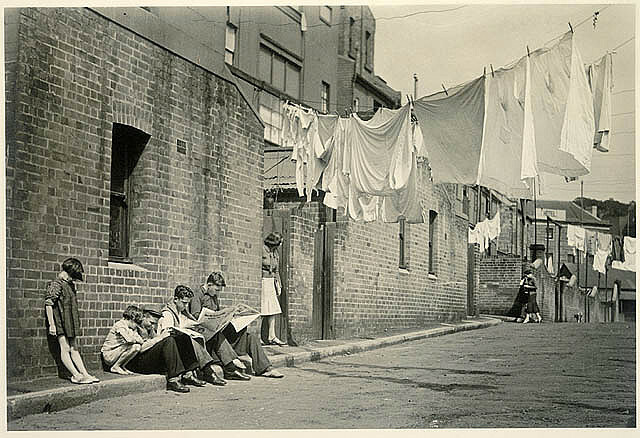 Notes: No title, thought to have been taken 1935 between Kent and High Streets, Sydney. Tram and taxi smash in Pitt Street, 25/6/1937 / Sam Hood. Notes: Trams and their operation were blamed for many accidents in Sydney’s narrow streets. 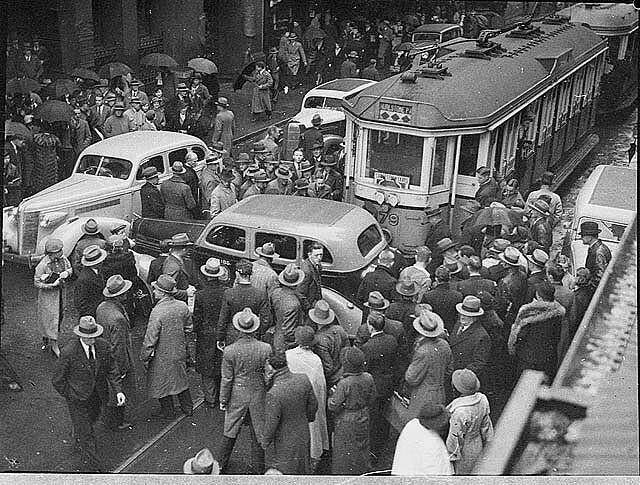 In this case, traffic in Pitt Street was held up when a taxi pulled out from the curb and was struck by one of Sydney’s notorious ‘toast rack’ trams. Pedestrians have added to the confusion, creating a bottleneck. In 1921 regulations were passed which required motorists to signal their intention to stop or turn, but hand signals were not always given or seen.